Do you know what time it is? It’s caramel apple time! Whether you prefer chocolate, coated or classic, we compiled four caramel apple recipes you have to try this fall! Now, if chocolate and sprinkles are your thing, this sinful recipe from epicurious will sooth even the most rabid caramel apple connoisseur. “1. Combine first 8 ingredients in heavy 2 ½-quart saucepan (about 3 inches deep). Stir with wooden spatula or spoon over medium-low heat until sugar dissolves (no crystals are felt when caramel is rubbed between fingers), occasionally brushing down sides of pan with wet pastry brush, about 15 minutes. 2. Attach clip-on candy thermometer to side of pan. Increase heat to medium-high; cook caramel at rolling boil until thermometer registers 236°F, stirring constantly but slowly with clean wooden spatula and occasionally brushing down sides of pan with wet pastry brush, about 12 minutes. Pour caramel into metal bowl (do not scrape pan). Submerge thermometer bulb in caramel; cool, without stirring, to 200°F, about 20 minutes. 3. While caramel cools, line 2 baking sheets with foil; butter foil. Push 1 chopstick into stem end of each apple. Set up decorations and melted chocolates. 4. Holding chopstick, dip 1 apple into 200°F caramel, submerging all but very top of apple. Lift apple out, allowing excess caramel to drip back into bowl. Turn apple caramel side up and hold for several seconds to help set caramel around apple. Place coated apple on prepared foil. Repeat with remaining apples and caramel, spacing apples apart (caramel will pool on foil). If caramel becomes too thick to dip into, add 1 to 2 tablespoons whipping cream and briefly whisk caramel in bowl over low heat to thin. 5. Chill apples on sheets until caramel is partially set, about 15 minutes. Lift 1 apple from foil. Using hand, press pooled caramel around apple; return to foil. Repeat with remaining apples. “1. Bring a large saucepan of water to a boil. Dip apples in boiling water for a few seconds, then dry with paper towels to remove any wax from the peels. Set apples aside; when completely cool, insert a wooden chopstick firmly into the bottom of each apple for a handle. 3. Stir butter, brown sugar, corn syrup, and sweetened condensed milk together in a saucepan over medium-high heat. Bring to a boil, stirring constantly, and reduce heat to medium. Cook until a candy thermometer reads 248 degrees F (120 degrees C), 25 to 30 minutes; stir constantly to prevent burning. A teaspoon of the syrup, dropped in a glass of cold water, should form a firm ball. Remove caramel from heat and stir in vanilla extract. Insert 1 craft stick vertically through the center of each apple, set apples aside. Butter two 13×9 pans, and make enough space in the refrigerator for them to sit evenly. Prepare Homemade Caramel as directed and allow to cool about 5 – 10 minutes (until it’s not incredibly runny) then immediately dip apples in caramel (note: from my experience this caramel doesn’t reheat well, so with that said you basically get one chance to dip so don’t let the caramel cool too long and work quickly when dipping, you may even want to have a friend help to be able work quicker). If you want to make yours to look like the ones pictured (with the apple showing through the center on top) then tilt apple when dipping and don’t fully immerse apple in the caramel, then carefully swirl the apple to coat all edges. Lift apple and let some of the excess caramel drip off and run the bottom of the apple along the inside edge of the pan. Tilt apple upside down and swirl just until the caramel is about to run off, then immediately turn upright and transfer to buttered baking dish in refrigerator. Repeat process with remaining apples, be sure to space them a bit apart on baking dish so they don’t stick together. Allow caramel coated apples to set in refrigerator. Blocks of chocolate can also be used, just chop into small, uniform pieces to ensure even melting. Also, I highly recommend using quality chocolate (chips or blocks) such as Guittard, Ghirardelli or Godiva (any of the G’s =). The lower quality chips don’t melt as well and tend leave that dull residue when they set. In a large enameled cast iron pot, combine butter, sugar, corn syrup and 1 cup heavy cream. Heat mixture to a boil just over medium heat (the 6 of an electric stove), stirring frequently. Once mixture has reached a boil, stir in remaining one cup heavy cream. Then without stirring,(again just slightly over medium heat) bring mixture to exactly 239 degrees then immediately remove from heat (this should take around 20 – 25 minutes). Carefully pour caramel into a medium nonstick saucepan and stir in vanilla (transferring caramel to another pan helps it cool faster and will leave behind some of the little brown specs at the bottom of the cast iron pan. You don’t have to transfer it but if you don’t just allow the caramel to cool a little longer than the 10 minutes). Allow to cool 10 minutes before dipping apples. To crush, place ingredients in a ziploc bag, seal and crush with a rolling pin. I probably make these too much because I’ve started naming them =). When I listed the white or milk chocolate chips I’m referring the which type of melted chocolate to coat them with. 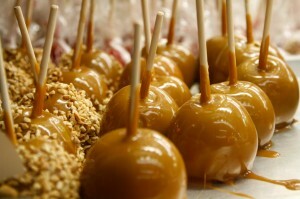 Ream’s Food Stores has all the ingredients you need… no matter what kind of caramel apples you want to make this year.